You will be picked up from The bus Station or From your Hotel In Arequipa at 4 :00 a.m. with a private bus. After three hours of driving we make a short stop in Chivay. Then we will continue until we reach the viewing point ‘Cruz Del Condor’. We will stop here for about one hour to see the condors fly and to enjoy the beautiful view over the canyon. Afterwards we will go to Cabanaconde, at 3287 m.a.s.l. Here we will have lunch and prepare ourselves for the trekking. First we will pass by the viewing point named Pampa San Miguel, from where we can see the paths over which we will walk. From here we start descending into the canyon in the direction of the village San Juan De Chucchu. This takes four hours approximately. On the way we will cross Colca River via a hanging bridge. During the trek the guide will tell you about the flora and fauna, medicinal plants and culture of the people living in the canyon. We will end this day inCosñirhua, a village at one hour walking distance from San Juan De Chucchu. In Cosñirhua the guide will prepare your dinner. You will spend the night in a local family house and be able to see their daily life. After breakfast we will continue the trek through the canyon. On the way we will pass through Malata, a small village. After two hours of walking we arrive in Sangalle, better known as the Oasis. In the Oasis you can relax and take a swim in the swimming pool. After lunch we will have time to explore the area, ten we will have dinner and spend the night in bungalows. The accommodation has share bathroom and don’t have hot water showers. 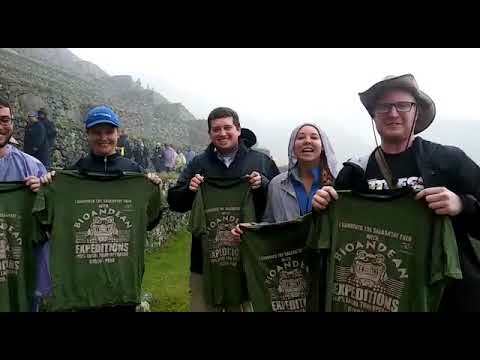 In the morning around 04:30 am, you will have a coca tee and we are going to start the trekking up to Cabanaconde where we will have a breakfast. After that we are going to go back, but we will stop in the condor cross view point. From here you will have a beautiful view of the geological form of the canyon and the over flight of the condors (is not 100% sure to see those birds)over another part of the canyon. You will return to Cabanaconde to take the bus to Chivay. On the way we will make a stop to see Inca and pre-Inca agricultural terraces from the viewing point Wayrapunku. In Chivay you have the option of visiting the hot springs for one hour. The medicinal water has a temperature of 38 degrees Celsius. Afterward you are able to lunch in Chivay before returning to Arequipa. We will arrive in Arequipa at 6:30 p.m. approximately. so we will take the bus back to Cusco at around 8pm so you will be in Cusco next morning at around 6 am. Student discounts apply to anyone who has a valid Green ISIC card at the time of the trek or who is 16-years-old or younger. For those using an ISIC card to receive the discount, we need to see a copy of the card at booking. For those booking children 16-years-old or younger, we need a copy of their passport at booking time. Please send all to info@bioandeanexpeditions.com.